A friend of mine Johnny is a very artistic and skilled welder fabricator. I recently visited him at his shop in Austin, where he creates custom items using Texas icons in the designs of his projects. During my visit he showed me his latest creation of a custom receiver hitch cover. The cover is made of 100% stainless steel and fits all 2" receivers, it was created using a plasma cut Texas Longhorn, Texas shape, Oval Ring and Stainless wire rope edging. This is one fine item and the pic's I posted below doesn't do it justice, to the fine quality and detail he used in the creation. He will be selling a few of them and I will have a link below to purchase with pay pal. 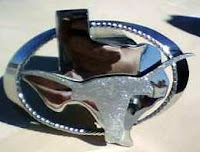 The hitch cover is 3 dimensional longhorn stands 1/8 inch in front of Texas shape then they are attached to the oval ring using his tig welder. The Longhorn shape is a matte finish, all other pieces are polished to mirror finish. He makes the stainless steel rope trim himself and makes the design pop out. Just wanted to promote projects created by other native Texans. If you purchase one of these limited quantity hitch covers you can feel good that your funds are going to a USA Lone star State American product with no imported items used. Please feel free to conta ct me with any questions. just ran across this post. 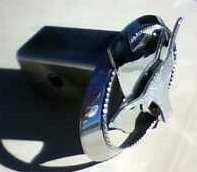 i was wondering if you still have any of these hitch covers or know where i can find one. please let me know.